Happy Women’s History Month! We’re excited and we know you are too. This month, we want to share articles, art, playlists, etc. on women that inspire you, past and present. There’s no limit- we’d love to hear about the women that inspire, inform, and shape you in honor of Women’s History Month. Please send your submission, a photo to pair with the article (it doesn’t have to be of you! ), and a short, 1-2 sentence bio. Of course, you are always welcome to submit under a pen name- or no name at all. 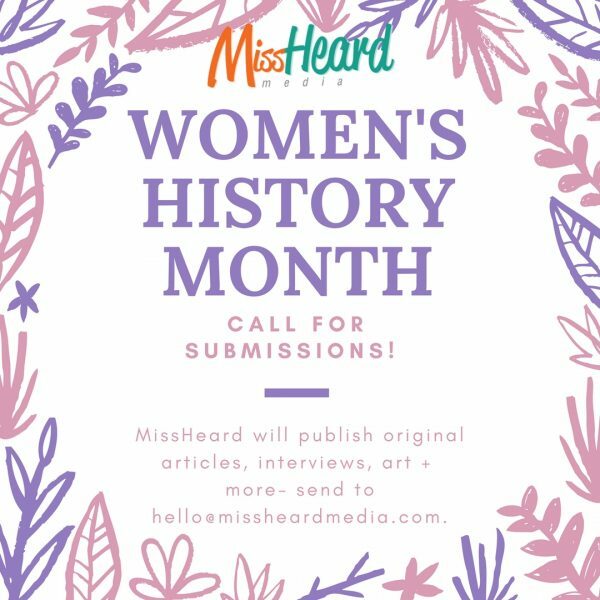 Send all materials to hello [@] missheardmedia [dot] com, and we’ll respond within 3 days!